Welcome back to all returning listeners and if you’re just listening to us for the first time, thank you for checking us out! Stash Dash – Katy finally broke the 1000 yard barrier, and Valerie is calculating out her new totals and we’ll have some yardage counts for you in the next episode. Tour De Fleece – Ended on July 27th and we want to see your pictures!!! Kitchener-Waterloo Knitter’s Fair – September 13, 2014 at the Kitchener Aud in Kitchener, Ontario. Royal Winter Fair – November 7-16, 2014 at Exhibition Place, Toronto, Ontario. Katy finished the Retirement Shawl for the lady she knows at the bank and has since given it to her and she loves it! 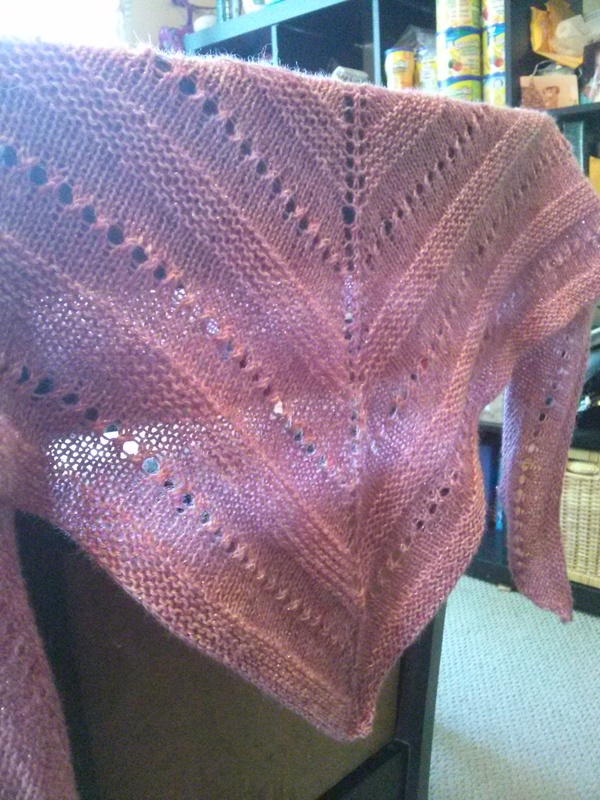 It was Lala’s Simple Shawl and she used Red Heart Stardust in Pink on 4mm needles. Valerie is working on the Flowers in the Snow Afghan and she’s very excited to see how it’s going to turn out because it’s looking very nice so far! She’s using Red Heart Super Saver yarn in various colours. She is also working on the Corner to Corner Afghan for little Benjamin to be given to him at Christmas. Katy was working on her Trillian shawl by Martina Behm as we were recording. At home, she is working on spinning some Squoosh Fiber Arts 100% SW Merino in the colourway ‘Split’ and she’s almost done! Valerie obtained three large skiens of Bernat Handicrafter Cotton in the colourways ‘Mod Ombre’, ‘Sun-kissed Ombre’ and ‘Pretty Pastels’. 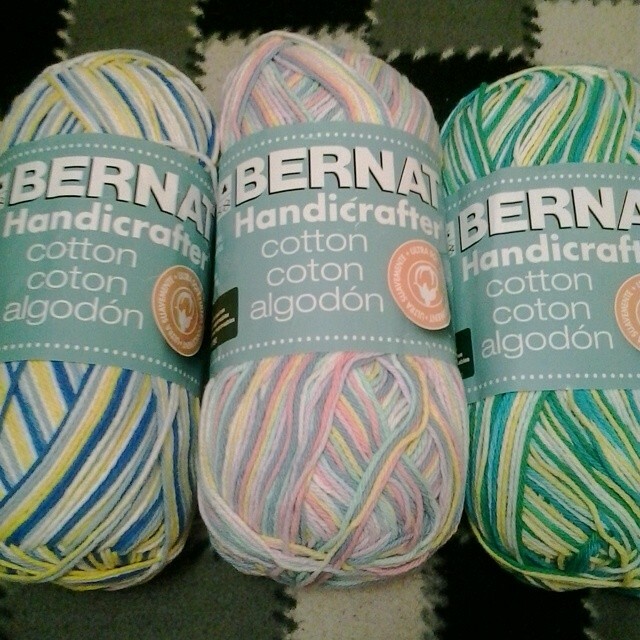 Bernat Handicrafter Yarn – more cotton! Katy got her braid of ‘Moon Pie’ by Two if by Hand and it’s gorgeous. 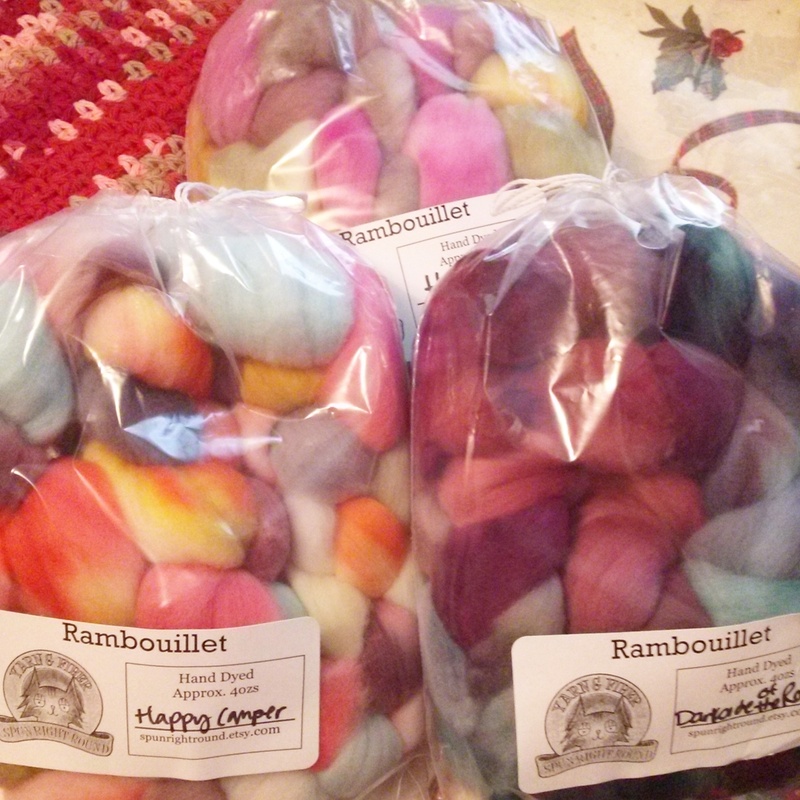 She also fell down at SpunRightRound on Etsy and bought 3 braids of Rambouillet in ‘Darkside of the Room’, ‘Happy Camper’ and ‘Herbs’. 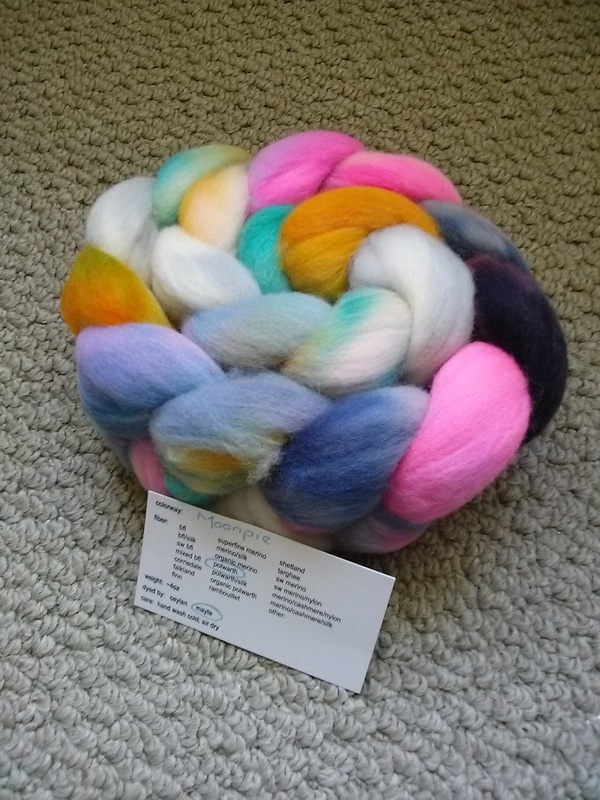 Katy went ahead and made an investment for her Kromski Sonata spinning wheel by ordering a Jumbo Flyer and two Jumbo Bobbins from Paradise Fibers. Valerie needs space for all of her yarn as she’s organizing her stash. Katy needs time to work on all of her crafts and practice spinning; even just 20 minutes of ‘me’ time. Valerie wants to procure more metal straight needles, and multiple sets of 4mm needles for different washcloths. Katy really wants a nice, hot bath! Preferrably with LUSH bath products! Katy wants to be able to be consistent in her wheel spinning – not be so thick and thin and be able to spin what she wants. Valerie learned the Magic Knot technique featured in the Magic Cake Ruffle shawl by Paula Emons-Fuessle. 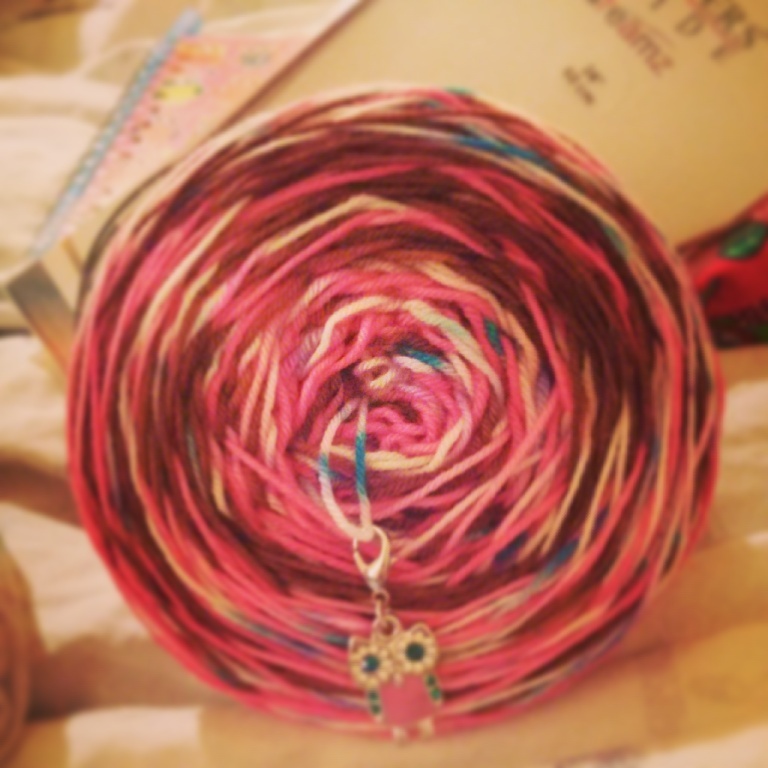 The Magic Knot has made all of her crafting with multiple colours a lot easier! 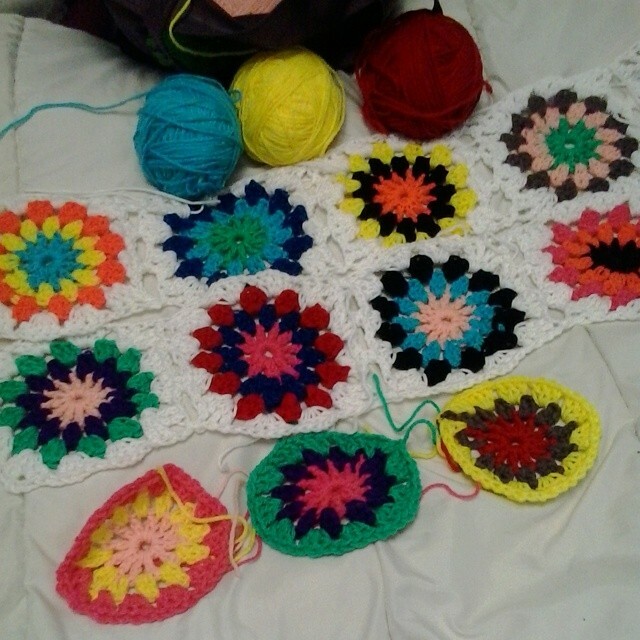 She also learned how to join her squares for the Flowers in the Snow Afghan as she goes along. Katy has learned not to drop-spindle barefoot… lest you get a puncture wound like she did. She also learned that one of her husband’s cousins is a knitter and spinner as well and they talked for quite a while at the family reunion she attended two weekends ago. It’s nice to find out you have family who share your interests. STOP! You had me at Yarn! Valerie has been very good and restraining herself from purchasing … or even looking to avoid temptation. Katy purchased a skien of ‘Stellar’ from The Cyborg’s Craft Room on Etsy in her Assparkilate base. She plans on using it to knit a pair of ‘Dalekanium‘ socks by Dena Stelly of Little Monkey’s Stitch & Spin on Etsy. Katy and her husband finished watching 24: Live Another Day and was surprised at how they tied everything up at the end. She is watching WWE with her husband, and she is also watching ‘Finding Carter’ on MTV. She started reading ‘A Breath of Snow and Ashes’ by Diana Gabaldon which is the 6th book in the Outlander series. Valerie is still watching the current season of True Blood and was sobbing during the last episode. She also watched the second season of ‘Hemlock Grove’ on Netflix and said the season finale was the strangest episode of any show she has ever watched! She also started reading ‘Outlander’ again in anticipation for the show premiere this August. As always, you can leave us messages and questions here on our blog and please feel free to check out our Ravelry group! « Episode 4 – No Judgey!